Refurbished Dell Blade Servers are up on sale, the servers which are certified Grade ‘A’ in terms of quality and highly efficient refurbished blade servers. The refurbished Dell servers available from the Server Basket consume less space, and less power improves the performance and of course with the lowest price investments. The Dell Blade servers enclosed in a way it can house multiple blades when on need and the framework is embedded with power, networking, and cooling. Server Basket presents quality refurbished Dell servers with the lowest possible prices. You might have certain business requirements, for the efficient business performance for its growth. You don’t need to panic, and we shall take care of it. You can specify the kind of Refurbished Dell Blade Servers you are looking for, with the detailed configuration specifications, at Server Basket, it will be made possible. We are ready for any configuration to be made, and everything will be available at the best possible price. We are glad we hired experts, who are experienced, who can guide for best servers for your requirements and polish any desired blade server as per needs. Refurbished Dell blade servers’ take up low power in consumption and improves the power management system by fewer power costs. This indeed is the best option to look for, when opting for a blade server. Dell blade servers show up high processing power, high efficiency by occupying minimal space and with the less possible cost investment. The additional favourable aspect here is if you are ready to buy blade servers in bulk. Most importantly, there is no limit to the number of servers that you can place an order for, we accept any number of server orders, doing this avail additional discounts on purchase of Refurbished Dell Blade Servers. Save more money, while ordering in bulk. We do not mislead with the offers. What is said, is what we act accordingly. The Dell Blade server is designed in a way, which can be compatible with any environment, space, and arena. Compacts with any given area and they show the ability to fit many servers into a single rack and provide high processing power. The design of the blade server can go with any business needs, or the enterprise size, be it large or small it has got an ability to fit into any environments. Get all the blazing features of the dell blade servers within the availability of lowest price deals. What you see, is what you pay for. Therefore assuring of the low price guarantee compared to any other online stores. We promise to provide the highly efficient Refurbished Dell Blade Servers for being your pocket-friendly partner. Don’t miss the deal, order right away if you are looking at this. 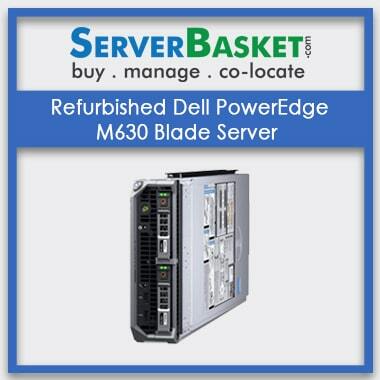 For being so kind, Server Basket provides quick dispatch & delivery options for Refurbished Dell Blade Servers. In-spite of providing all the generic possible attractive offers, avail another bonus from us. We ship the products usually in 2-3 business days irrespective of the number of the product count. Quick delivery options are available across India to every nook and corner, to every possible destination Like Pune, Bangalore, Coimbatore, Mumbai, Chennai, Delhi, Hyderabad, Kolkata, Lucknow, Nagpur, Ahmedabad, Surat, Indore etc. Order right away, and avail the benefit of doorstep service.